I have heard that CloakCoin uses a number of technologies to achieve privacy. What is the difference between these privacy technologies (if any)? I heard that CLOAK uses something called Enigma to provide privacy. Which privacy implementation is better, and under which circumstances? 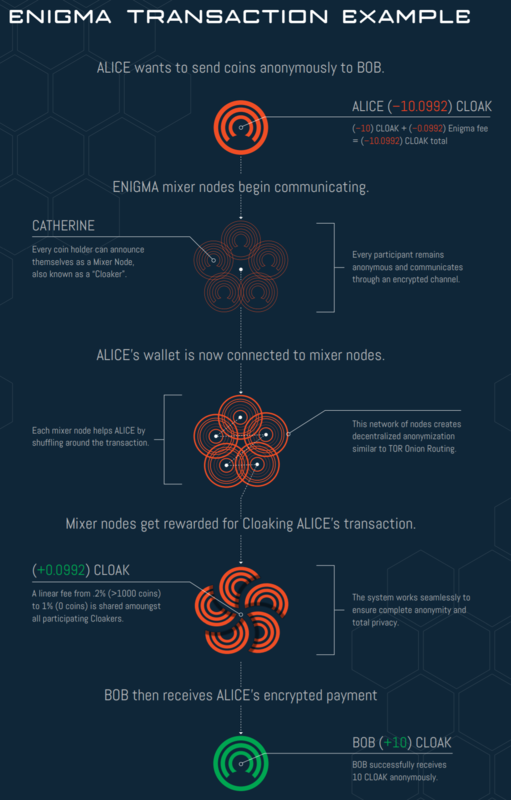 CloakCoin's "Enigma" protocol is essentially a mixing protocol similar to CoinJoin or PrivateSend in Dash. This is very different than Monero. The nodes mentioned above get "entropy" from coins provided by the mixers themselves. You place inherent trust in these mixers. The first mixer learns the sender address (you). The last mixer learns the recipient address (especially if stealth addresses are not used, more on the later). There a variety of situations of possible collusion where multiple rounds of "cloaking" can trivially reveal the entire path of a "cloaked" transaction. Transaction amounts are still visible. If I send 2.34578 CLOAK to someone with "Enigma," it can be relatively trivial to trace the amount transacted. Even if the outputs are split into specific, set denominations, there are still potential issues by counting the number of outputs as is a weakness of PrivateSend. The entropy is even smaller than PrivateSend and other CoinJoin-based approaches, since the entropy is limited to the money held by the "Cloaker" operators. However, this is a greater incentive to provide coins for cloaking than Dash (similar to the liquidity providers they used a while back). In their whitepaper, Cloak refers to three more privacy features: 1) Tor onion routing, 2) stealth addresses, and 3) combined "super-transactions." Let's evaluate these in more detail. Tor is a network-layer of communication, not a consensus layer. While it is important to hide this metadata (including IP address), it is less essential than hiding information recorded in the blockchain. Tor doesn't protect you alone if you make an in-person purchase, for example. Furthermore, there are other ways to hide this metadata, including using WiFi at a coffee shop, a trusted VPN, etc. The entropy set is still smaller. Rather than selecting from the entire output set with Monero, CloakCoin users are still restricted to select outputs controlled by the "Cloakers." There is still trust. Whereas ring signatures in Monero provide plausible deniability without having to trust nodes ("Cloakers") to provide this plausible deniability, "Cloakers" can collude to remove this plausible deniability. This is especially a concern if these mixing services are run on a handful of providers with access to server logs, including Amazon AWS, Choopa, DigitalOcean, etc. Stealth addresses are optional, limiting the effectiveness at reducing many forms of blockchain analysis. A merchant may refuse to reimburse to a stealth address, for example. "Super-transactions" are not a new idea. The intent is to "condense" the history of multiple transactions into one. For example, if money was transferred between addresses A -> B -> C, it could theoretically be condensed to A -> C. Unfortunately, the whitepaper is light on details on how this could be accomplished, so we have no idea how effective (or ineffective) this could be. Other projects like Grin take advantage of a similar idea. Again, this feature needs to be fairly widely-used to be effective. Monero uses three cryptographic technologies to provide privacy for all transactions. Ring signatures hide the origin of funds spent by hiding the real output among other sources of money. Ring confidential transactions (RingCT) hide the amount. Stealth addresses break the link between sources of funds and addresses (making rich lists impossible). You can learn more about each individually by searching around in StackExchange and watching the linked videos. Perhaps most importantly, you can use Monero without having to worry about trust. The math is prepared locally without needing to communicate with clients to "mix" anything. You do not need to pay a percent fee to the "cloaker" nodes to provide their entropy. The standard Monero transaction fee is based on transaction size, not the amount. This makes Monero far more efficient when sending medium or large amounts. Finally, Monero has the network effect of all its privacy features being supported by all its merchants and wallet providers. If CloakCoin is ever accepted by a service, it is likely they will not support all of CloakCoin's privacy features. Overall, CloakCoin (CLOAK) uses privacy mechanisms that are inferior to Monero in essentially every way.